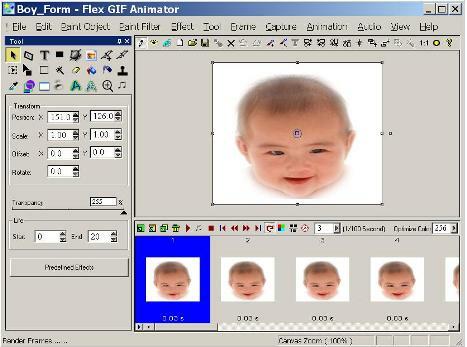 Flex GIF Animator 8.67 is user-friendly and powerful animation software. It makes GIF, Quicktime, and Flash film. You can also create self play congratulation animations with synchronization audio and Real-time 3D effects. It runs on Windows NT, 2000, XP, 2003 Server, and Vista operating systems. It supports objects animation and keyframe (contain Rotate, Scale, Alpha, Position, and Effect Paremeter) based animation. The Flex GIF Animator supports special 3D effects like 3D bevel, emboss, drop shadows, and glows. It has a fitted higher paint tools, audio recorder, morpher, and screen recorder..